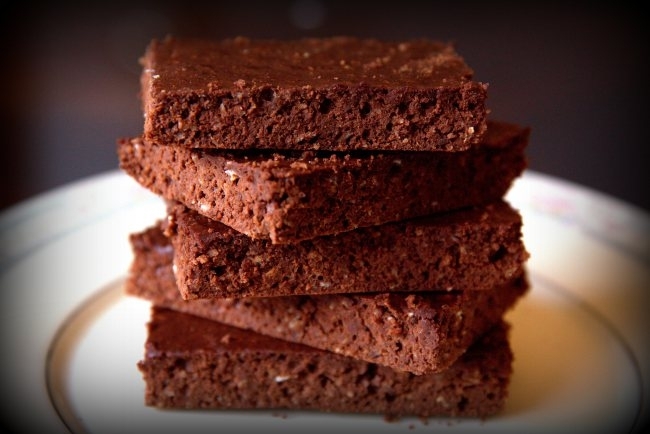 A high protein brownie recipe that tastes delicious after a hard workout! You can eat a few of these guilt free too! In an electric mixer, whip egg whites, Splenda, applesauce, and vanilla extract. My mom made these the other day and whipped the egg whites for a long time, and they came out great. In a separate bowl, combine oat flour, protein powder, cocoa powder, diet hot chocolate packets, baking powder, and salt. Next, beat in these dry ingredients into the wet ingredients in the mixer. Once thoroughly combined, spread batter evenly into a sprayed 9Ã—13 pan. Bake for about 11-12 minutes. Note: These brownies will appear slightly undercooked when you take them out. As long as the edges are slightly pulling away from the sides of the pan, then this is good!